When the forecast for Katelyn and Greg’s wedding called for rain, they took it in stride. 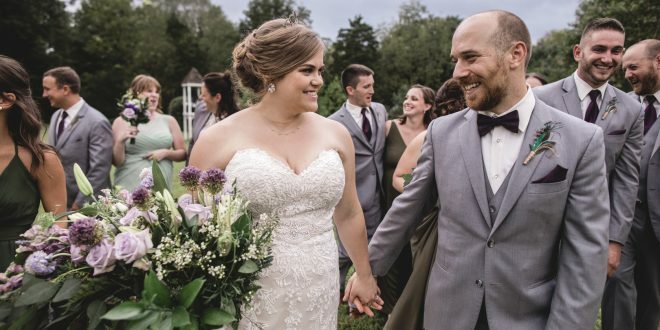 Katelyn said she’d made peace with whatever the weather would bring and resolved not to let it distract her from what was most important, the love that she and Greg share. They were getting married and that was all that mattered. 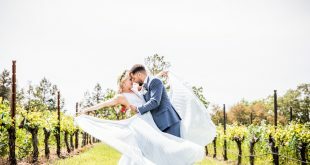 They chose the Historic Jasmine Plantation outside Richmond, VA for their wedding, which was to start with an “unplugged ceremony” on the lawn. 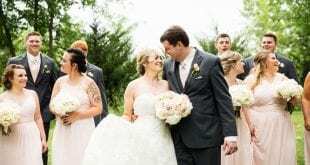 It looked like the rain was going to hold off, but when drops started falling five minutes before the big event, everyone rallied and got the ceremony reset on a covered porch attached to the property’s 1700’s farmhouse. 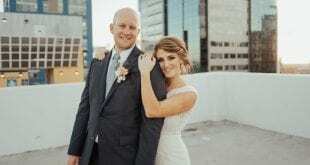 Katelyn and Greg didn’t care where they said “I do” just as long as they had each other and their friends and family were all just excited to be there to witness this adorable couple tie the knot. Katelyn was gorgeous in her lace mermaid cut gown with its sweetheart neckline and dramatic semi-cathedral train. She skipped the veil and paired her look with a sparkling tiara and unique vintage inspired earrings. Her bouquet was one of the most gorgeous we’ve seen! A giant mix of lush greenery and florals in shades of purple from lavender to violet. It featured roses, snapdragons, lilies and chive flowers – an absolute knockout. Her bridesmaids carried smaller versions of the same floral combination and the purple shades were a perfect compliment to their green gowns, which varied in style and shade, giving each lady a chance to showcase her unique beauty. As for Greg’s crew, they rocked light gray suits and paired them with plum ties to play on the purple color palette. Even his “grooms gal”, got into the act with a suit of her own, which she paired with a white cravat. At the tented reception, a backdrop of white linens, draped sheer fabric and twinkle lights set the scene for whimsical decor that paid homage to Katelyn and Greg’s love of the great outdoors. Centerpieces sat on rustic wooden bases and featured small arrangements of purple and white florals, greenery, moss and camping lanterns. Plenty of votive candles completed the tablescapes and cast a romantic glow throughout the space. A large crystal chandelier hung in the center of the tent and gold accents gave the decor a polished feel. Katelyn and Greg got the party started with their first dance before they invited guests to join them on the floor for a good luck hora, a Jewish tradition. 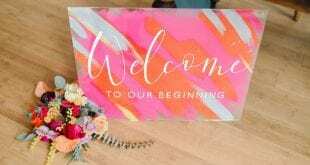 The newlyweds created specific hashtags for guests to use when posting their pics and videos of the big day to social media and for dessert they served donuts along with their wedding cake, delicious! Congratulations Katelyn and Greg!